The Duval County Health Department offers Title 10 coverage for men who qualify based upon income and family size. 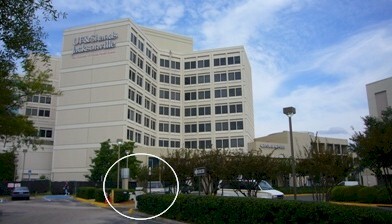 The Family Planning Office is on the 3rd Floor of the University of Florida Shands Hospital. Please call 904-244-4233 to speak with Emma Taylor, R.N., and express an interest in Title 10 vasectomy services. She will set up a time for you to visit her for vasectomy counseling and financial screening. If eligible, you will be referred to a urologist in Jacksonville contracted to provide vasectomy services for the Health Department. 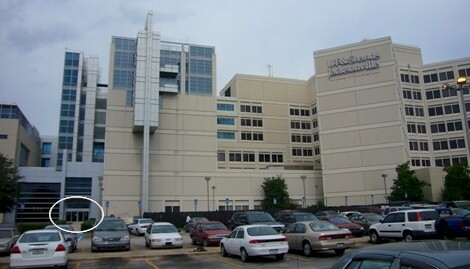 Drive up the inclined entry road and turn left in front of the hospital to enter a parking lot (entryway circled in photos). Take a ticket to enter the lot. Bring the ticket with you and it will be validated during your visit so that you do not have to pay to park. ... and the Family Planning Office is near the bank of Staff Elevators. If there are no more Title 10 funds for the current fiscal year (July 1 - June 30), or if you do not qualify, you may want to have your vasectomy performed by Dr. Doug Stein or Dr. John Curington. Drs. 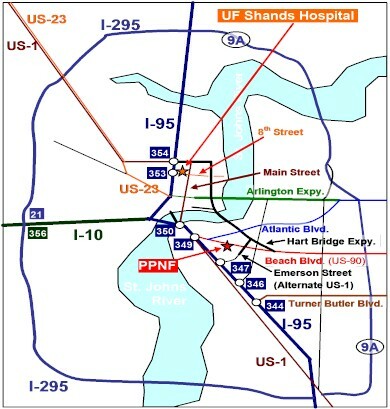 Stein and Curington are currently not providers for the Duval County Health Department, but perform vasectomies on a regular basis in Ocala. The fee is $590.